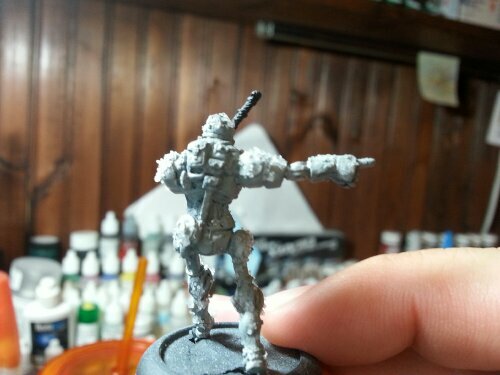 I picked a Mishima starter from the game Warzone: Resurrection and started working on them this past weekend. The starter comes with 12 models. Ten ronin troopers, Hiroko the leader, and a large Meka walker. 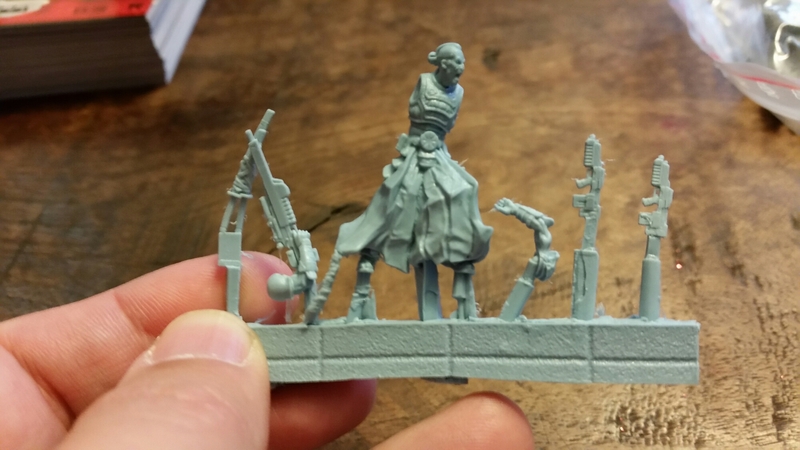 The models are made from resin and the models are nice with a few bits of flash that are easily cleaned. I was able to get the models together while watching some Netflix and tonight I finished the bases. 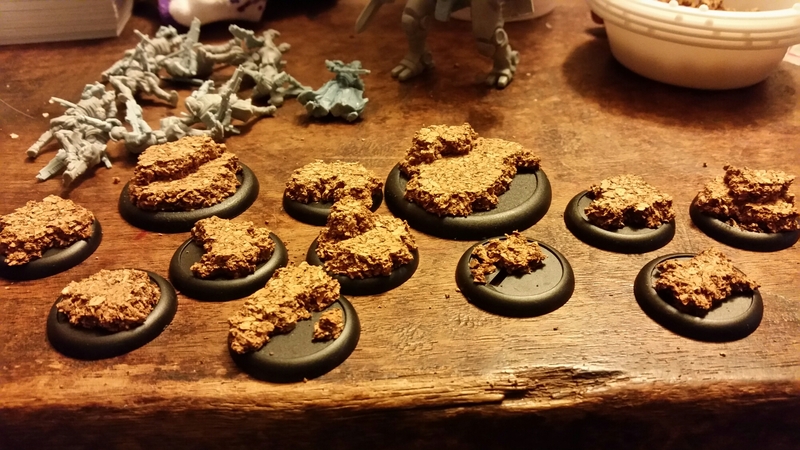 The bases are made from some cork sheets and glued onto the bases. I wanted it to be simple, but interesting. Hopefully I’ll get the models painted over the next few weeks. How many of my readers have played Warzone? What do you think of the game and models? 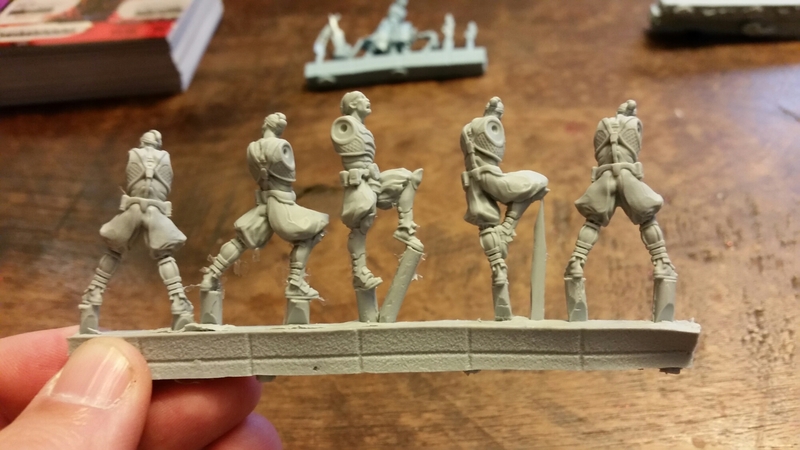 I picked up some Freeblades models by DGS games in September and I’m making slow progress. I think I”m about done, but I’ll need to add some details to things like pouches, hilts, etc. This is the Haradelan Questers starter, then with more models added. They are knightly models on a quest for peace and justice. I’ve since done quite a bit more painting on these models and even painted the bases black. I’ll update when they are all done. I completed a set of ruined pillars tonight using some simple drybrushing techniques. The pillars come from Advanced Terrain who had a Kickstarter back in 2010, I believe, and even though the store is closed, I was able to order some of the ruined pillars as seen above.Advanced Terrain who had a Kickstarter back in 2010, I believe, and even though the store is closed, I was able to order some of the ruined pillars as seen above. 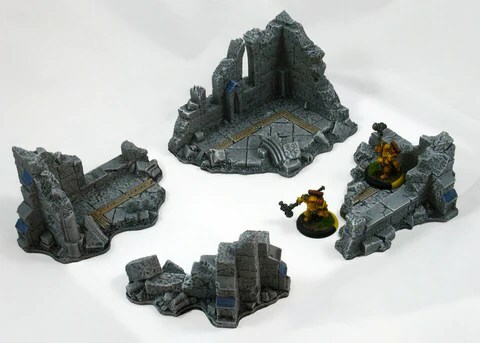 The pillars and other terrain sets are rubber, and are molded after Hirst Arts terrain. It’s some of my favorite terrain. I will be using this stuff for Recruits this weekend when I do my Hell Dorado and Relic Knights events. This is some great terrain and Patrick ever opens his shop up again, I’ll be buying some more. I’m still working on that Saracen starter for Hell Dorado slowly but surely. Below you’ll find some pictures of the leader, Nazir Ibn Hamid Ibn Hajjad and his trusty sidekick Youssaff. I’ve been painting the entire starter up now for about two months, which shows how slow of a painter I am since I don’t sit down to paint on a regular basis. Youssaff describes Nazir as being so compassionate, he wept for every soul lost in the battles in Hell. Therefore, Nazir asked Youssaf to burn his out with his scimitar so that he shall forever see the light of Allah. Youssaff has been his companion ever since. In game, Nazir provides a good use of buffs as well as hitting power. However, you don’t want to lose him in the game as he provides quite a bit of the army’s command points at 5. Since command is important, you want to keep Nazir around. However, with Nazir’s healing ability, you’ll want to get him into base to base with your allies so they can be healed. Being near Nazir gives the rest of the army a +1 to combat, which is nice, but again, you have to keep him towards the front of the army. Besides some touch-up and a couple little spots of black, I think he is done. Below, you can see the progress I was before the previous painting session. Not the bands on the arms, the embroidery on Nazir’s cloth, his beard, and jewel are not painted as shown above. For the sword, I tried an experiment using non-metallic metal style of painting. There are a lot of tutorials to view for this. I didn’t do that good of a job as I’m still learning. However, I used the method of NMM for the sword, then glazed over it with Plate Mail Metal paint by The Army Painter. The choice of colors was based on the fact that I wanted something more colorful and brighter than the off-white of Youssaf’s trousers and the rest of the traditional garb of the other models. I started off with P3 Menoth White Base, an off white color, then, added some RMS Linen White for the highlights. I washed the cloth with P3 Flesh Wash, then went back over the cloth to bring the color back up to the highlights. For the blue on Nazir’s outfit, I started with Warpaint Electic Blue. I added some of the base from Youssaf’s pants to the blue to highlight it up. I used P3 blue wash, then went back through with highlights. For Youssaf’s skin, I used P3 Idrian Flesh, and also some RMS Earth Brown and slowly added in some lighter brown such as Leather brown from the Warpaint line for the highlights. The Hell Dorado models are nice, and have a lot of character. They do require some clean-up as the mold line is obvious, but not bad. A simple file such as a fingernail file or miniature file will do the trick. Finally, here is a group shot of the starter, with Nazir and Chalms done, while the blessed warriors and Pillar of Faith continue to get paint slapped on them. I’ll keep everyone updated with progress! I’ve set up a Facebook account, and I’m running a contest. 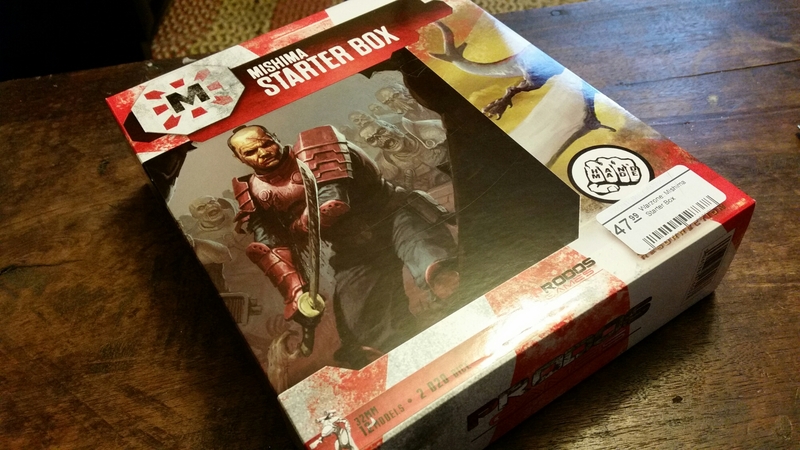 When we get to 50 likes on the Facebook page found HERE, I’ll randomly pick someone who is a follower of this blog and also likes the new Facebook page and let them pick out one of the resin display cubes by Secret Weapon Miniatures that I reviewed. The randomly chosen person gets their choice! If you haven’t, check out the review and let me know what you think. I’ll also do a give away at 100 likes as well, most likely, so if you don’t get the prize the first time around, you may get a chance the second. 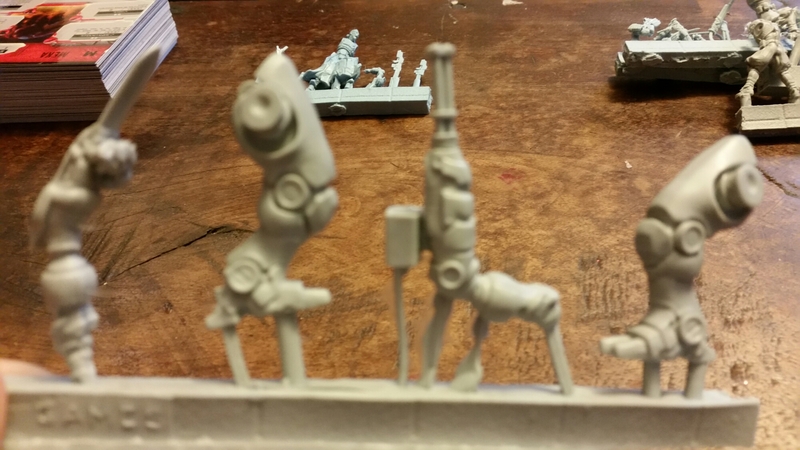 In the meantime, I am working on a Combined Army starter from Infinity, the game. I’ve primered them and have just put my first layer of paint on, a nice Deep Blue by the Army Painter Warpaint range. See you on Facebook as well as here! I’ve been painting the two Hurleys for the Sedition Wars boardgame from Studio McVey and on for a while now, and finally finshed them last night. I’m treating this like a board game and didn’t clean or prep the models, but that didn’t detract much from the simple painting I gave them. 6. Daemonic Yellow and a highlight of white for the lights. 7. Spray Testor’s Dull Kote on it. So, I’ve made one more step on my first experiment of weathering with salt. This technique is fairly popular and has been used by the gaming and modeling community for a while now. A simple Google search for “Weathering with salt” will yield all sorts of tutorials. If you want to see the first step of primering, click HERE. In some of the tutorials, they use nail polish remover as a way to remove the paint to get a “weathered” and “rusted” look as well, but I chose to use salt only. However, I’ve never tried it before, so I wanted to document my progress. 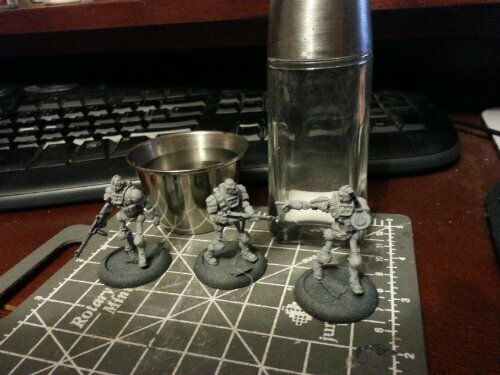 Below: salt, a small cup of water, and my AE-WWII Robot Troopers. Here, below, are a couple of images with the salt on the trooper. Next, I used the salt in a bowl, and pinched the salt and sprinkled it on the areas that were painted with water. I continued doing so until all the areas were ‘salty’ enough. The next step will be to let them dry, and as I’ll be gone a couple of days over the weekend, the salt should stick to the miniature as it dries. Afterwards, I will use an airbrush to lay down some paint, then brush the salt off, leaving the grey as seen above, showing through. These guys are also part of my 2013 11+1 Challenge.I hope it turns out! So, for my next project, I’m going to work on my AE:WWII American sci-tech detachment. I’ve been enjoying the game a lot so thought I should at least give the models that aren’t painted a chance to shine on the field of battle. The models below were primed black and lightly dusted with white from above to give a faux zenithal highlighting technique. AE-WWII is a game by Blacball Games, formerly owned by Darkson Designs. The game had a little update in the form of a Kickstarter, and I’ve really come to like it. Before hand, I had played AE-Bounty, based on the same mechanics, but hadn’t jumped into the AE-WWII side of things until recently. AE-WWII is a combination sci-fi / historical game with a unique army building mechanic. Instead of building on points, a player selects a detachment type, and simply fills slots based on that detachment. In the list building, you can “remove” a slot to upgrade other slots and do some other neat things. It makes for an enjoyable experience if you are looking for something outside of building by points. Blackball Games describes AE-WWII as, “AE-WWII is a skirmish-based miniatures game set in the retro sci-fi setting of an alternate World War II.AE-WWII combines miniatures wargaming and historical fiction into a flexible, points-free detachment system that is strategic and tactical –as fast as it is fun. Players can create purely historical forces or units comprised of the new technological wonders and terrifying horrors.” Another unique thing about the game is you can build a purely historical detachment, or weird it out as you see fit. 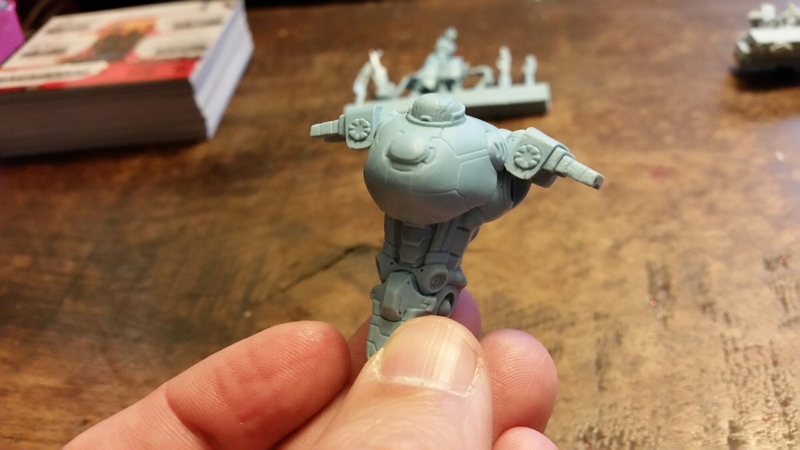 What you see above is the primed version of a unit of Robot Troopers, a “green” choice for the American’s sci-tech detachment. I’m going to try and paint them up with American pride in blue, white, and red. We will see how they come out. Also, since I’m still challenging myself, I’m adding these to my 11+1 challenge, where I’ve challenged my readers to paint 11+1 models for the 2013 year. The models have to be your own, and you have to keep them. They are your models to display and keep, not for sale or trade. Below is the stock photo of the painted Robot Troopers. I recently finished some editing work for The Army Painter who makes a line of model paints and scenic basing accessories. For those that don’t know, The Army Painter is famous for their brand of “dips”, called Quickshades, and primers. 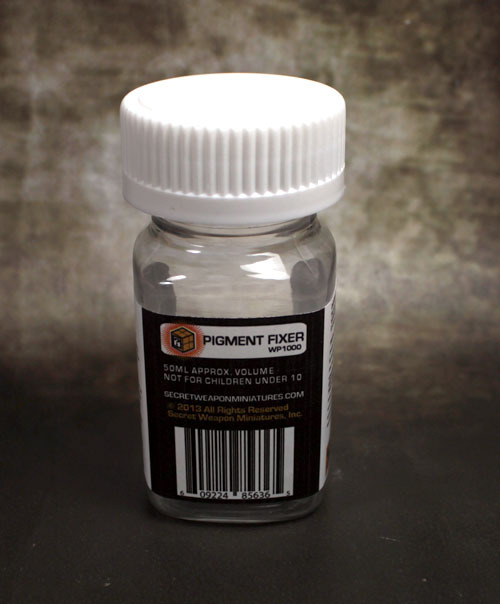 They recently added new colors of primers and they primers match their Warpaint brand of paints, making touch up and painting your models a breeze. 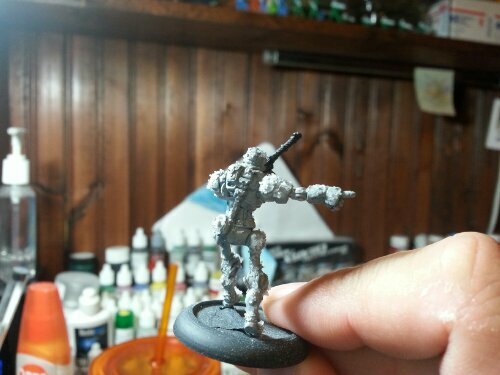 I’ve never used their Quickshade or primers, but most people like the effect it gives on a model. 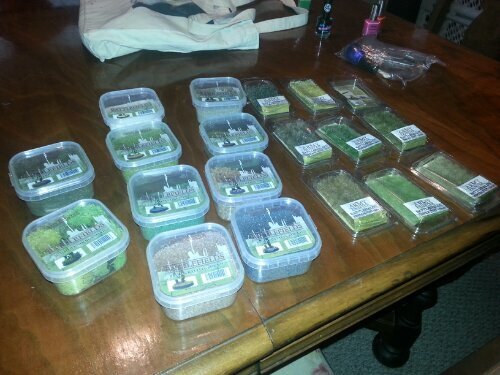 For the work I did, they sent along a sampling of their product as you can see above. I’ve used some of their product before, notably the “winter turf” brand of grass and some basic grass. With the samples above, I should be set for a lot of creative endeavors with my models and will make a great addition to my growing supply of basing materials. I’ve also started using their paints to supplement the P3 paints I own, and so far, I like their consistency and the way they lay down on the model. One thing that you will have to deal with is that they Warpaints dry a little shiny, but that’s nothing some Dullcote wont fix. 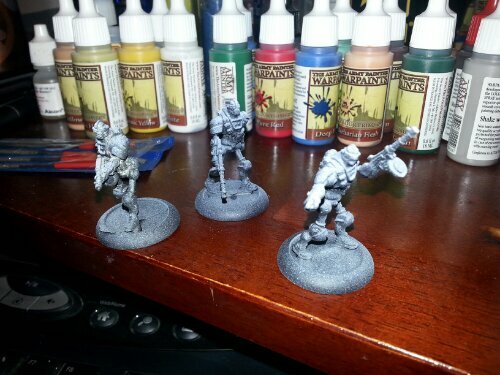 In fact, I use Dullcote on almost all of my models when done, so it’s no big deal. Since I’m doing freelance stuff on the side, if anyone out there needs a proofreader, editor, or writer for any of their products, I am available for work immediately. Official references and resume can be submitted upon request. If you haven’t yet, give The Army Painter products a chance and let me know what you think of them. Greetings fans, friends, and customers! Today I bring you an announcement more than a year in the making — and what an adventure we’ve had along the way! As of today Secret Weapon can finally offer you our unique enamel pigment fixative — and to celebrate I’m listing it at more than 16% off through the month of July! This unique enamel fixative creates a permanent bond between your model and the pigments, without altering the texture or color of the pigments. Apply with a brush over the pigments via capillary action to keep a soft texture. Sprinkle pigments over fixative to get a rough texture. Or create a wash with pigments and fixative for a dusty finish. This is a one-of-a-kind product, with a viscosity even thinner than isopropyl alcohol, that gives you incredible flow through the pigments to help ensure a strong bond. Order yours today — we expect the first batch to sell out in a hurry! Give this product a try and let me know what it’s like. I haven’t ventured far enough into the hobby to try pigments with my painting so I’m curious what people think.